Disney Frozen Birthday Invitation. 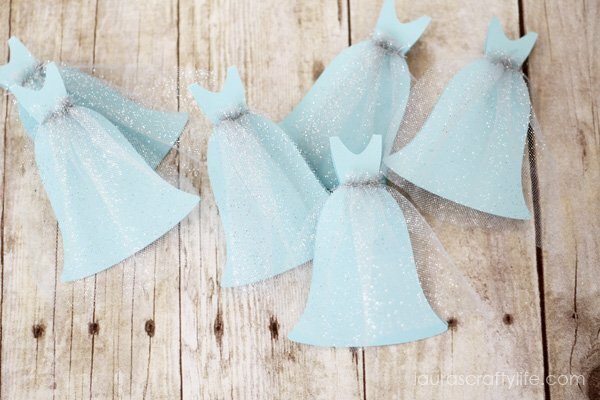 Create a beautiful Frozen themed birthday invitation that imitates Elsa’s beautiful gown using your Cricut Explore. Are your kids as crazy about Frozen as mine is? Everything is Frozen over here. So, naturally, my daughter requested a Frozen themed birthday party for her 5th birthday. 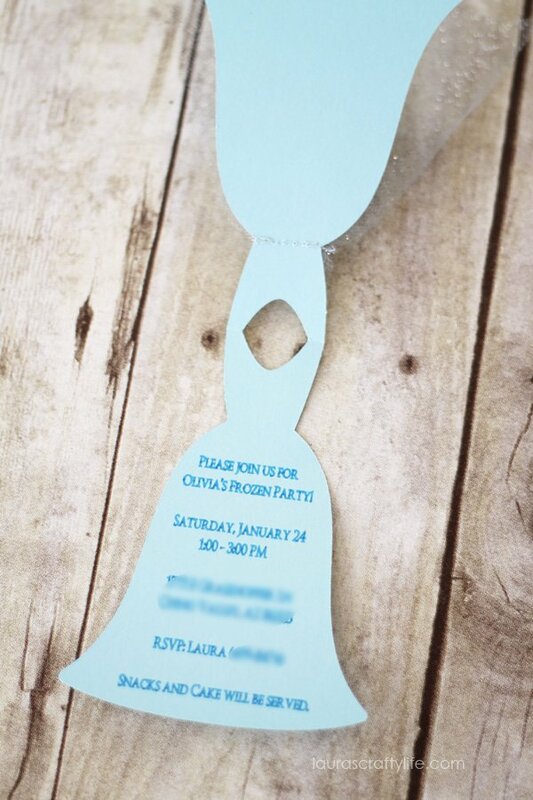 All parties start with a fun invitation. Often, I create a digital invitation that I have printed at my local photo retailer. 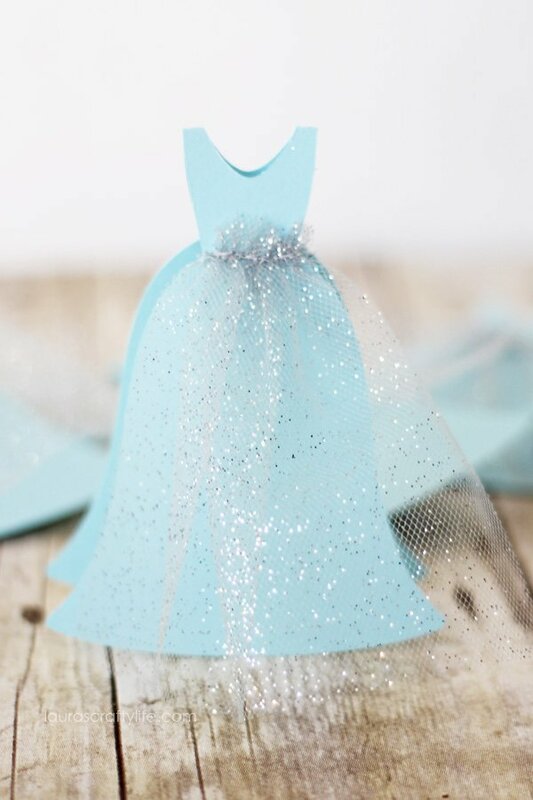 But for this party, I had the perfect idea for creating a pretty dress shaped invitation to look a little like Elsa’s gown. I started by creating a design in Cricut Design Space. Note: After personalizing your text, you will need to click on select all at the top, then select “attach” in the layers palette for the design to print and cut correctly. The font I used is called Goudy Trajan Regular. This was my first project trying out the pens with my Cricut. I was worried the font would be hard to read since it was going to be pretty small, but the Cricut wrote it all perfectly with my blueberry Cricut pen. I created a dress shape that would open to reveal the birthday party details inside. After the Cricut Explore wrote the birthday information and cut out the dresses, I added a little skirt to each one. I roughly measured how much tulle to use, using the width of the roll and cutting it just a tiny bit longer than the length of the skirt. I purchased my glitter tulle in a small roll at Walmart. 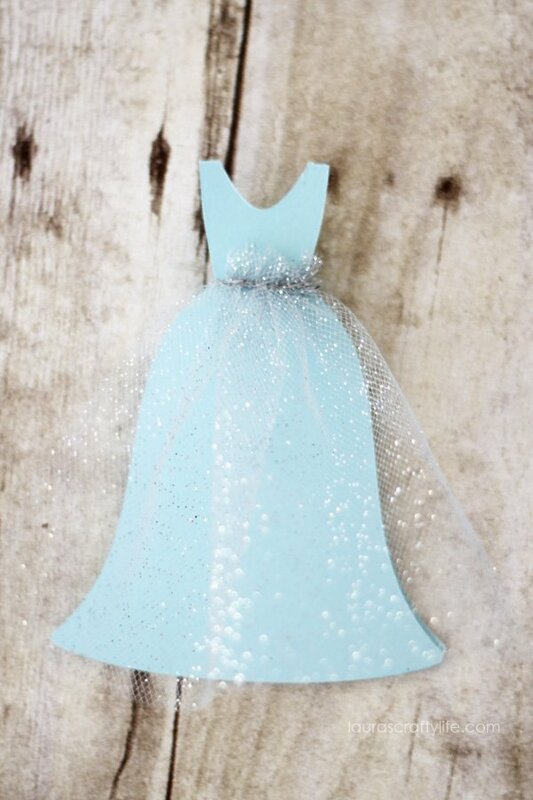 Use a sewing machine to gather the tulle at the top. To gather, use the longest straight stitch you have. Do not backstitch at the beginning or end. 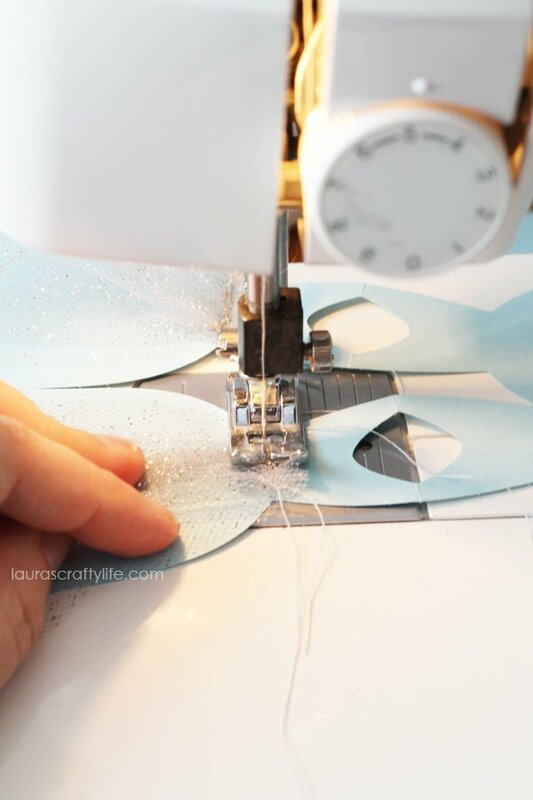 While holding the threads on one end, gently pull one of the threads (either the top thread or the bobbin thread, not both) from the opposite end until your tulle is gathered. Sew the gathered “skirt” onto the front of the invitation. The Disney Frozen birthday invitations turned out even better than I originally imagined. They perfectly set the tone for the rest of our Frozen birthday party! At this time I do not sell these invitations. But the instructions are included in the post with how to create your own. Thank you for stopping by! 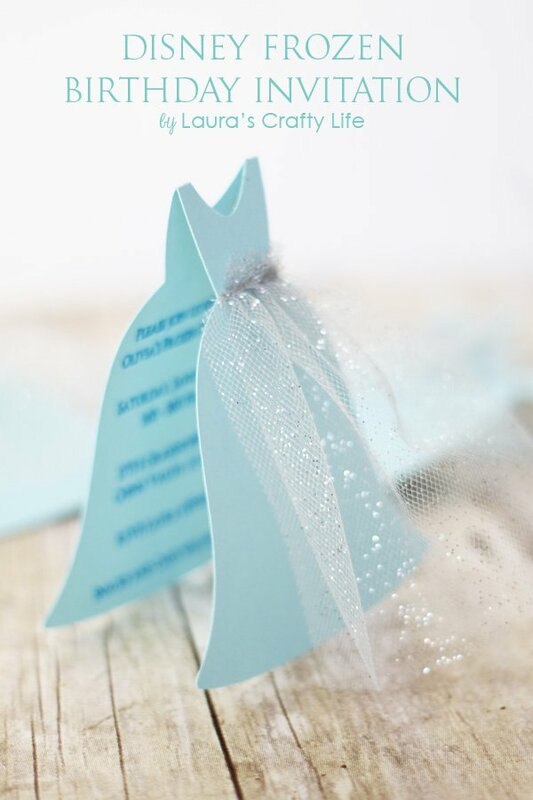 I absolutely love your Elsa dress invitation, and I have included it in my “Ten of the best Frozen invitations” post on my blog today. I hope that’s okay and I hope you like it. Thank you so much for sharing my invitation. I love the round up. Have a wonderful week! I did one text box for the entire invitation wording. To add text to your design, click the ‘add text’ button on the left side. This will open up a text box. You will type all your wording. Simply click enter to start a new line. To center the text, you want to click ‘edit’ on the right side. It will bring up options to change the font type, size and how you want the text aligned. You simply click the box for ‘align center’. This will center all your text in your text box. Once you have the text aligned you can drag the text box over your dress outline. Then you will click ‘select all’ at the top. Under the layers tab click ‘attach’. This will keep both designs together and will print the text exactly where you need it to on the dress. Hope that helps! I have a Cricut Expression 2. Am I able to use the Cricut Design Space and pens or do you have to have the newer Cricuts? 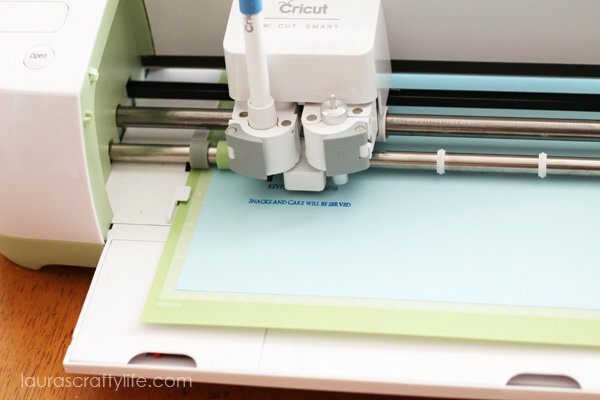 To use Design Space you have to have a Cricut Explore. You can use pens with your Cricut Expression. You may be able to recreate something similar in Cricut Craft Room for the Expression. Wonderful invitation! Do you have a PDF file? Since I made these with Cricut Design Space, I don’t have a .pdf available. The design work was all done with the Cricut software. I absolutely love this invitation. Can you tell me how big they are after completion? Any chance you can tell me what measurements you used in design space? I have the imagine and just upgraded to the Cricut One and it’s hard to figure out size on my new machine. Hi Laura, I can’t find this when i click the link. Any idea if its still around? Thanks so much! Sorry about that. Sometimes on these older projects, the links stop working. Here is a new link you can try: Disney Frozen Invitation. Please let me know if you have any trouble with the new link!